Most teenagers own a mobile phone. Some are able to buy their own phone from the money they earn from working part-time, but the more likely scenario is that you, their parent, ends up buying them a mobile phone. You may be perfectly happy to do this, but often the arrangement ends up an unhappy one for many reasons. 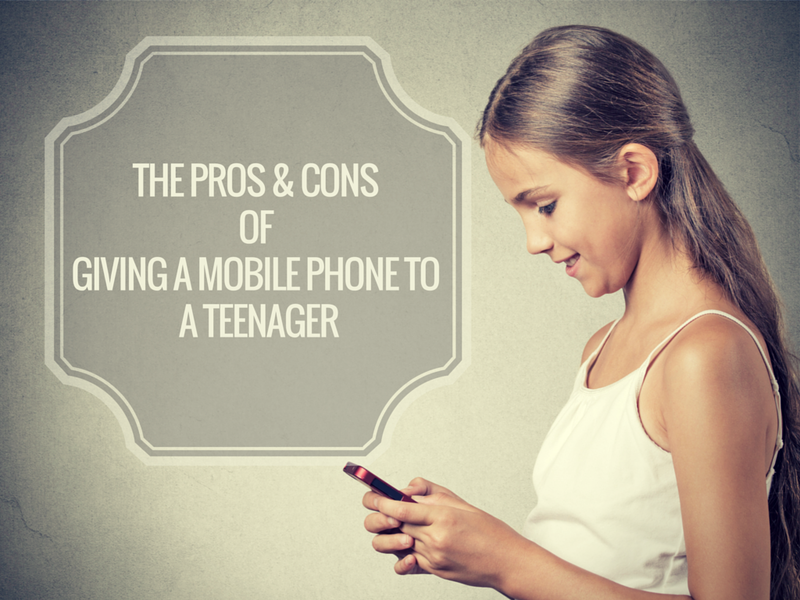 So what are the pros and cons of buying a teenager a mobile phone and should you even bother? Do Teenagers Really Need a Mobile Phone? It’s debatable whether a teenager actually needs a mobile phone, but if you asked them, they would undoubtedly say a phone was essential to their happiness and social standing. Without a mobile phone, the average teenager is unable to function–they can’t talk to their friends and life just isn’t worth living. But before you give in and rush off to buy your teenager a brand new iPhone 6, read the following list. One way of making a teenager do exactly what you want them to do is to use a combination of bribery and blackmail. If they need some persuading to help you do a few chores around the house, you can offer to put more credit on their pay-as-you-go mobile phone. Or if they are being a pain, you can threaten to confiscate their cell phone as punishment. Mobile phones are an excellent way of staying in touch with a teenager when they are away from home. If your teen has gone to a party or a festival and you want to stay in contact, call or text them. Or, if you want to keep track of them surreptitiously, install a tracking app on their phone. If a teenager has a mobile phone they can use it to call for help if they find themselves in a sticky situation for some reason. They won’t even need any credit on their phone–it is possible to make an emergency telephone call from a mobile phone without any credit whatsoever. The main reason why parents baulk at handing over a mobile phone to a teenager is that they fear being the unhappy recipient of a huge monthly bill. Having a pay-as-you-go plan will help, but someone still has to put credit on the phone and the chances are good that it will be you. A SIM only monthly contract deal is a far better option. Instead of committing to two years you can pay for a rolling one month tariff that includes free minutes, texts and data instead. A lot of teenagers are highly irresponsible. They can’t even look after their gym kit at school let alone take care of an expensive mobile phone. So do you really want to fork out for a new iPhone and discover that your little darling has ‘lost’ it on the school bus? Most teenagers are always on the lookout for the newest and coolest model of technology. This means that although they might be delighted with the new mobile phone you buy them for Christmas, two months later it is viewed as ‘old’ and ‘not cool’. Unfortunately, you will then need to invest in a newer model phone or face a campaign of sulking for months. Conversation around the dinner table tends to be rather limited when a teenager is in possession of a mobile phone. Instead of intelligent answers to questions, all you are likely to get are a few grunts and the sight of a face peering intently at a small screen. That and lots of buzzing sounds indicating incoming text messages and Facebook alerts. You could just choose the first phone you see, or you could play it safe and ask your teenager which phone they actually want. The latter approach is probably best, as you don’t want to pay good money for the latest phone, only for your gift to be treated with absolute contempt. Kajeet is the smart phone for kids, empowers kids with technology and gives parents tools to keep them safe. Kajeet is the only wireless service provider in America dedicated to kids and education.